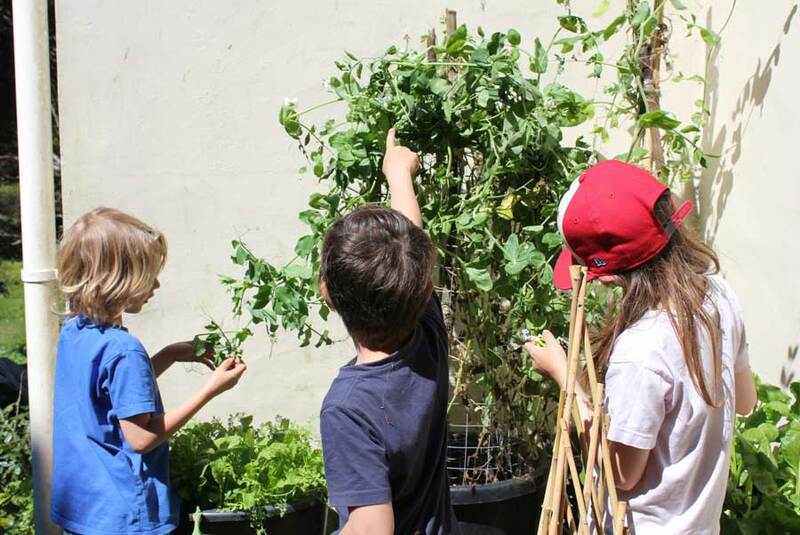 Along with strawberries, peas are probably the biggest draw to a vegetable garden for kids. Sometimes this draw can be more than anticipated – don’t be surprised, come harvest time, to find a trail of empty pods leading off around the garden in the same direction as junior gardeners. Let’s not leave all the fun to the younger generation, peas are an unfeasibly delicious, sweet vegetable that have ‘summer’ written all over their plentiful pods. Peas have been cultivated for some 9000 years but it wasn’t until the sixteenth century that Italian gardeners produced varieties that were tender enough to be cooked and eaten fresh. Previously peas were dried and often ground before eating. 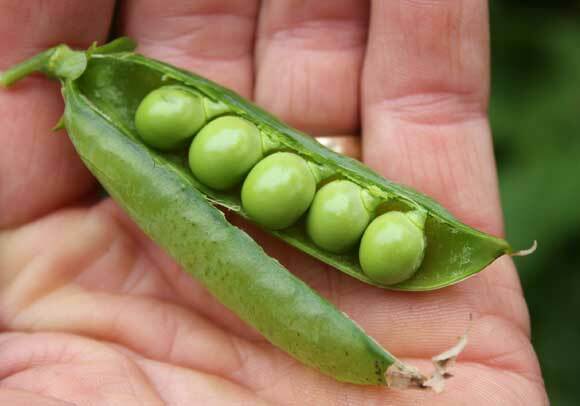 Peas are a good source of iron and vitamin C.
Companions Cucumber, sweet corn, melon, potato, beetroot, carrot. Quantity 3 plants per person. 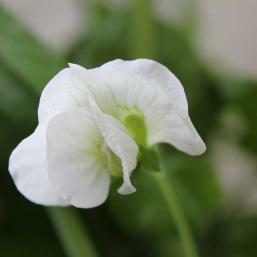 Snow Pea Goliath open pollinated variety. A vigorous, tall growing vine with sweet crisp pods. Sugar Snap Dwarf open pollinated variety with stringless pods. Great for containers – plants only reach about knee height. 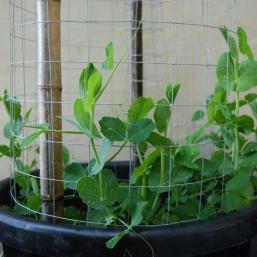 Petit Pois Provencal (garden peas) heirloom variety ready to eat within 55 days of sowing. 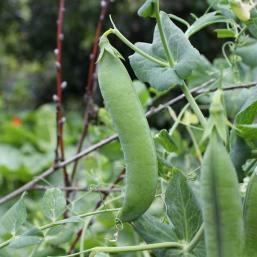 Harvested when young for the sweet, tender green peas that shelled from the pods. Can also be eaten pod and all. Alderman Tall Climbing heirloom variety growing very tall and producing a bumper crop of literally hundreds of dark green pods. 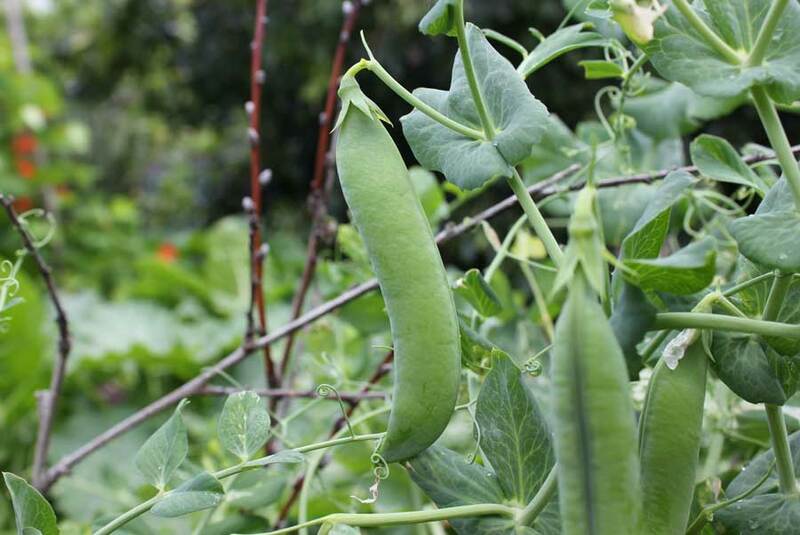 Pods are nearly a full hands’ length from end to end and yield delicious sweet and juicy peas. Definitely needs support. Regular picking prolongs harvest. Peas grow better in the cooler months so in most parts of the country they can be planted from February through to October. They won’t thank you for sowing them in cold wet ground so wait until the right conditions come your way or improve your soil with better drainage and protect seedlings with cloches. 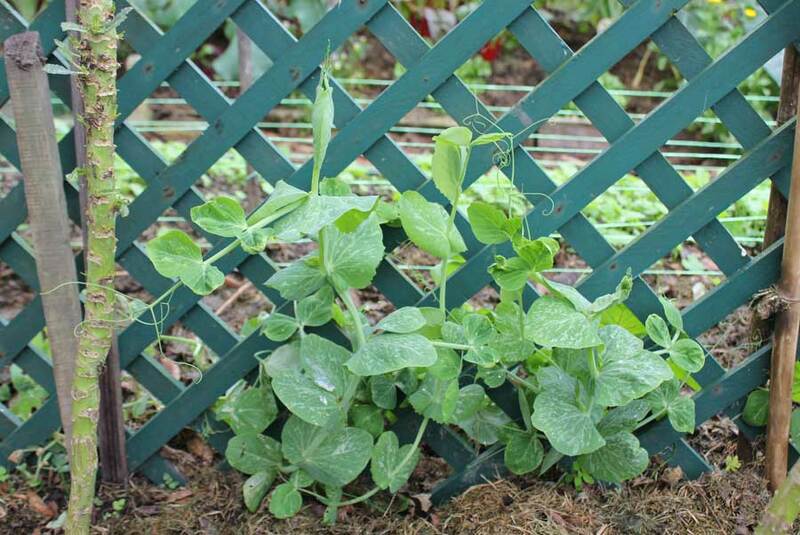 Peas can grow in light shade but they generally do best in an open, sunny position. Apart from the bushy, dwarf varieties, they tend to want to scramble up something like a few twigs, bamboo canes or some chicken wire and will offer a useful spot of shade to the likes of lettuces - which can shelter in their shadow from the intensity of summer sun. 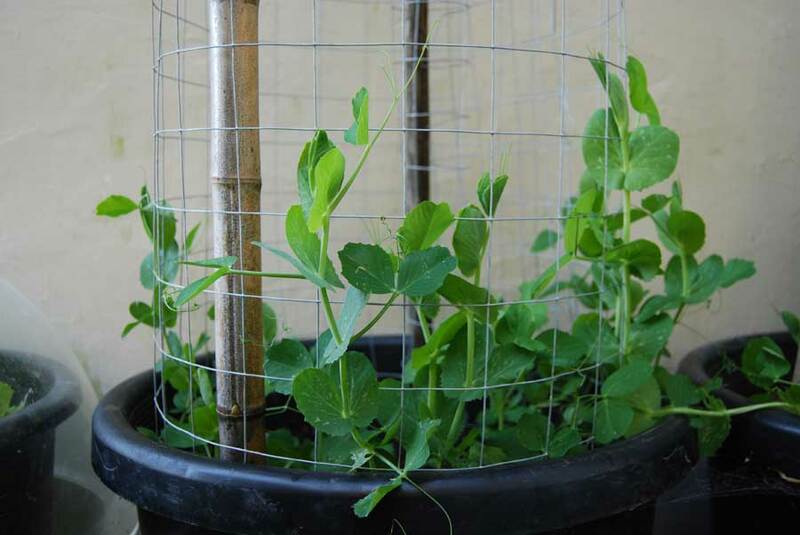 Peas can be grown in containers (Snow peas and Sugar snap peas work particularly well) which means if your garden cannot offer them the best spot then you can take them to where the sun does shine. 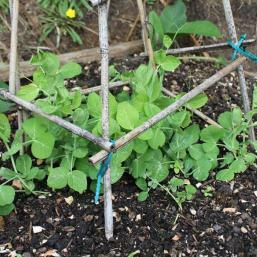 Peas like a soil that drains well and contains plenty of well-rotted organic material. 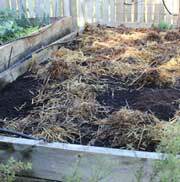 If your soil is looking low on organic material then dig in something that has already rotted down - such as garden compost or worm compost - to enrich it. This organic material is not only there to hold moisture for long enough for plants to utilize it but also to feed the pea plants. Before planting, your soil should be well dug through to the depth of a spade’s blade - so that there are no large lumps – and then raked level. 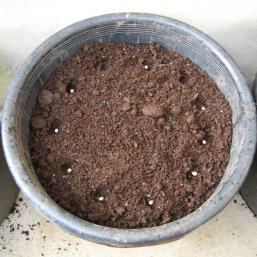 Peas are generally sown straight into the soil. They are very user-friendly thanks to their un-fiddly size. 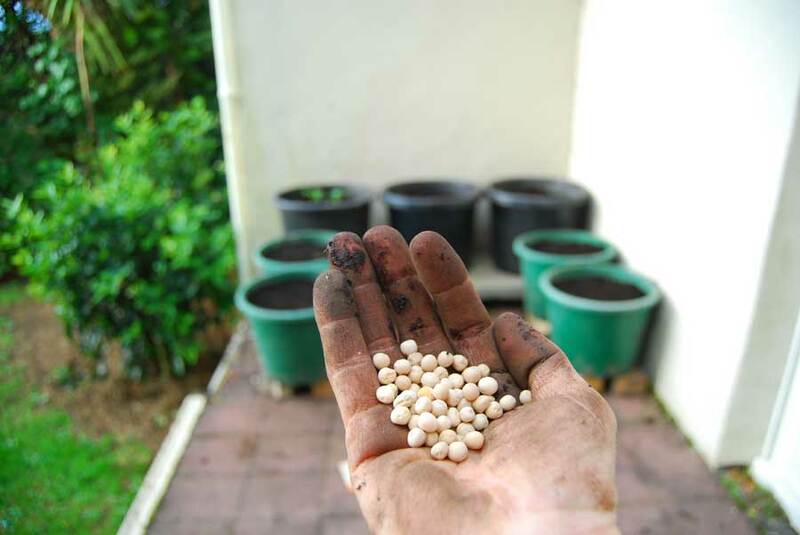 I always soak my pea seeds in cold water for at least an hour or so before planting them just to give them a gentle wake up that can help to boost germination. 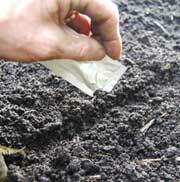 If your soil has been well-prepared then you can simply drag two lines across the surface that are just over a hand’s length apart. Next, spread your first and second fingers into a ‘V’ and drag them down the centre of the two outer lines. Plant your pea seeds along each of the lines created by the dragged ‘V’ – they should be about the distance of your two finger tips when making the ‘V’ sign apart as you plant them. Your rows of peas should be about a forearm’s length apart. 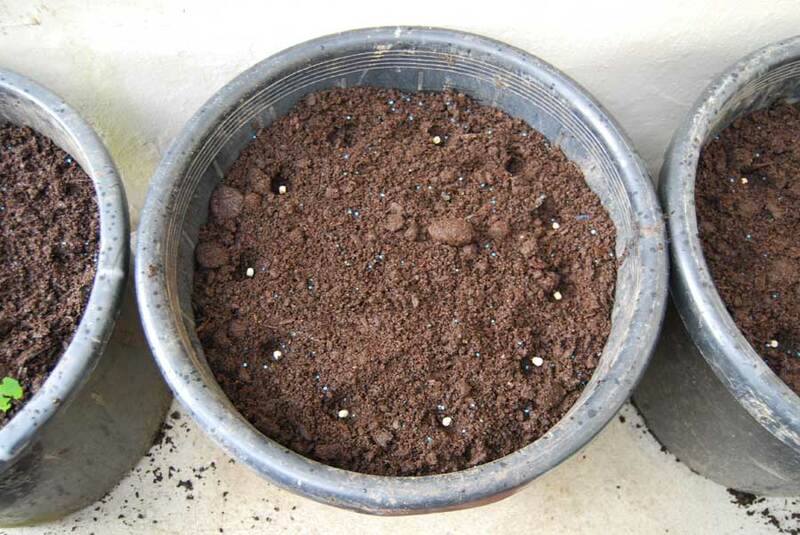 If planting during the wetter months when slugs and birds can be at their hungriest then sowing into trays or punnets of potting mix is a good idea. Plant out when seedlings get to about the length of your little finger. This can produce good results thanks to plants having a head start and being better prepared to shrug off any attack. 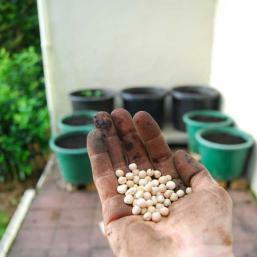 You need to protect the young seedlings from birds – that love to nip off the tender tops. 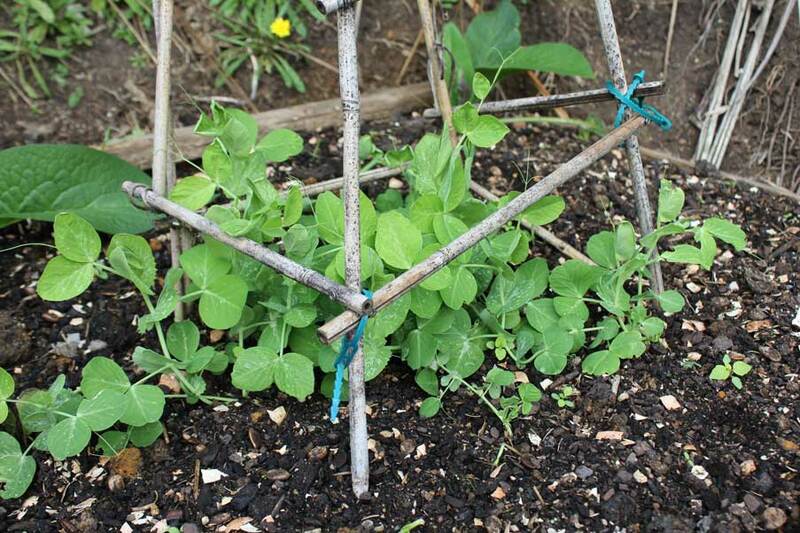 Straight after planting or sowing stick a load of small twiggy branches – with the twigs facing upwards – alongside the planted rows of peas. You can also use chicken wire for this, just unroll the right length for your row and bend it along it’s length to make a tunnel. Place over the planted row. Keep aphids under control with Neem oil, Garlic oil spray or Tomato leaf spray. Aphids can transmit viruses such as Pea mosaic which causes plants to be stunted with dark and light green patterning on their upper leaves. Mildew can also be a problem. Remove affected foliage, if practical, and treat with Baking soda spray. 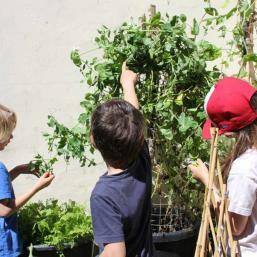 As the seedlings start to grow they will quickly scramble up the twigs or chicken wire. 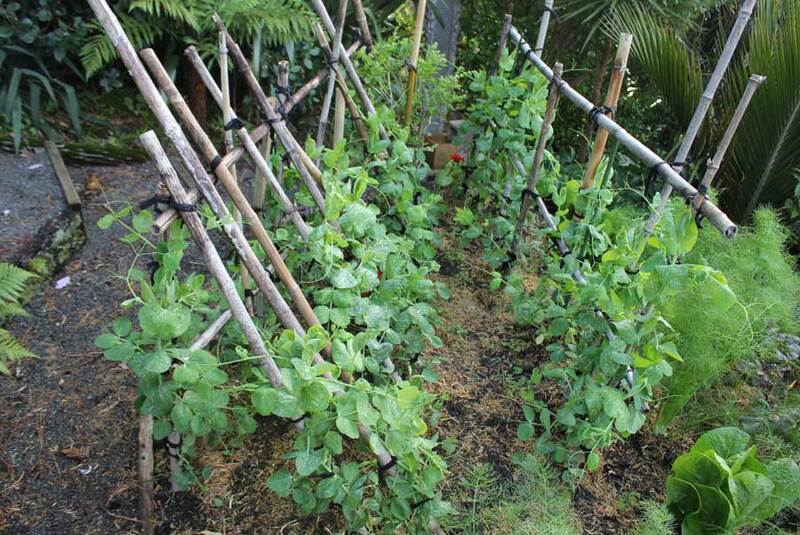 You may need to add further support using larger twiggy branches or sheets of chicken wire standing vertically on edge secured to bamboo canes. Keep soil moist by watering in dry periods and mulch around the base of the pea plants to retain moisture throughout all weathers. 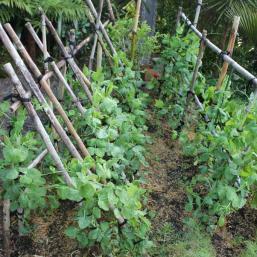 I give my peas a boost with liquid worm juice every two weeks just to keep them well fed and happy. Peas are sweetest the moment they are picked. The longer you wait to eat them after picking the more starchy they become – so hold off harvesting till just before you need them. 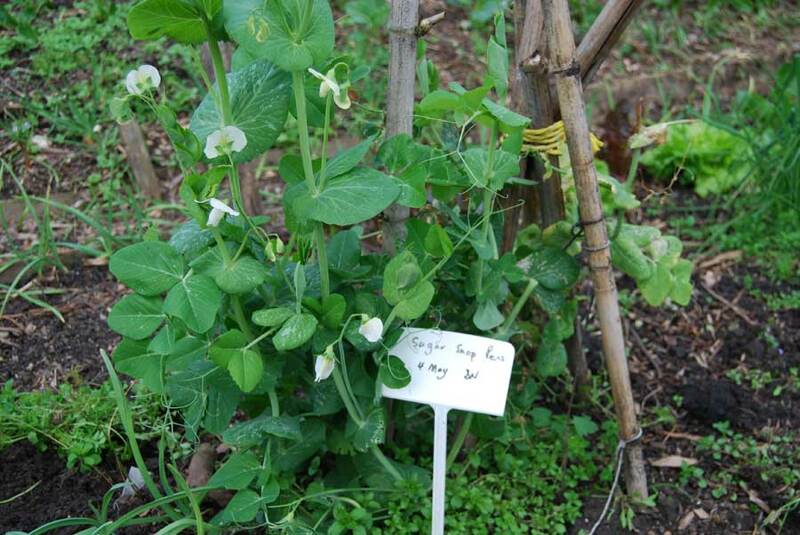 Peas take from 7 to 11 weeks to reach maturity depending on variety. 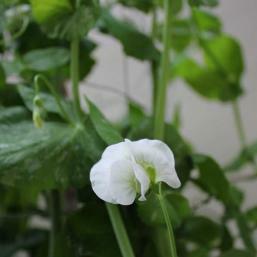 Normally the peas are ripe at the bottom of the plant first. 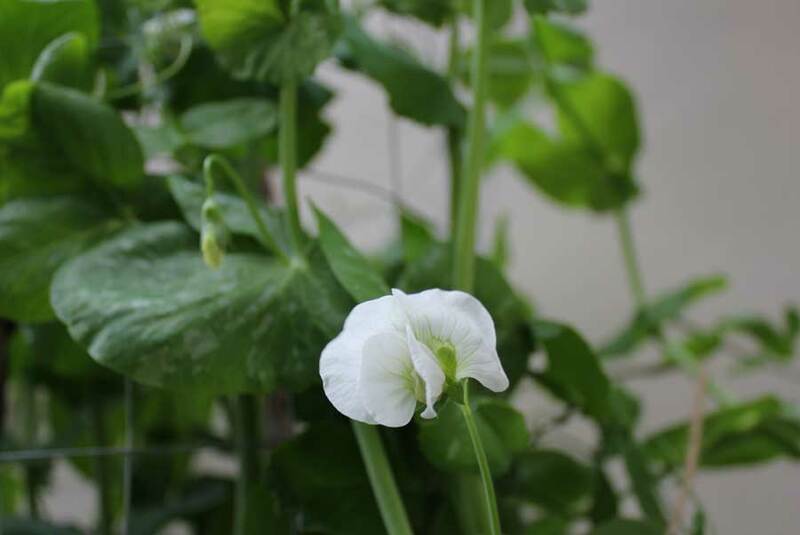 Pick the pods when they have swelled and are nearly rounded but before the peas inside start to show their shape through the pod – they’ll be touch and starchy if you let them go this far. 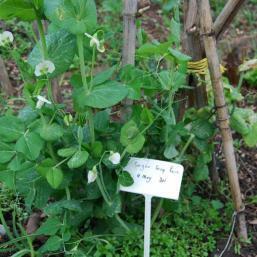 Not that most of us need encouragement to do so, but regular picking will encourage plants to develop more peas. 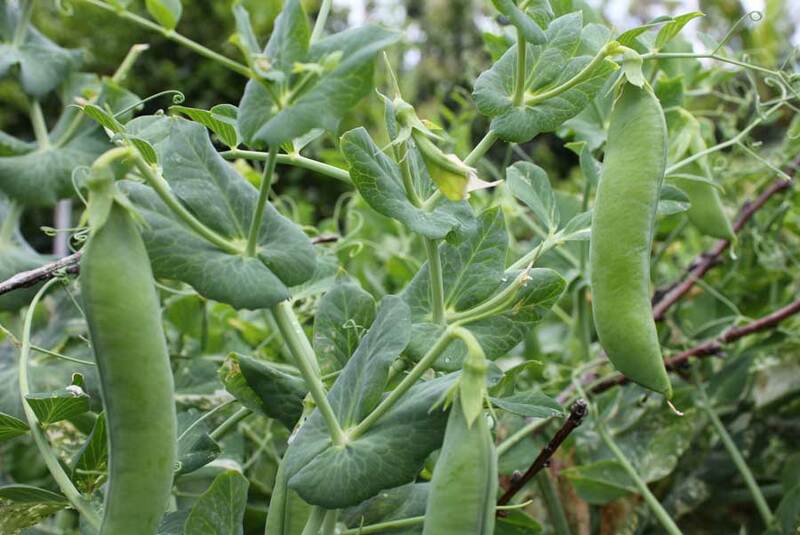 Mangetout – or ‘snow peas’ are picked before their pods swell. This means they are tender and not tough and have the fullest flavour. 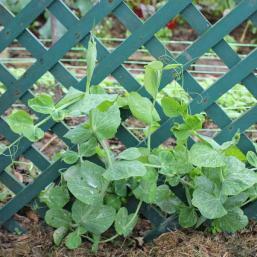 Sugarsnap peas are also eaten pod and all but their pods are rounded when eaten – rather than flat. 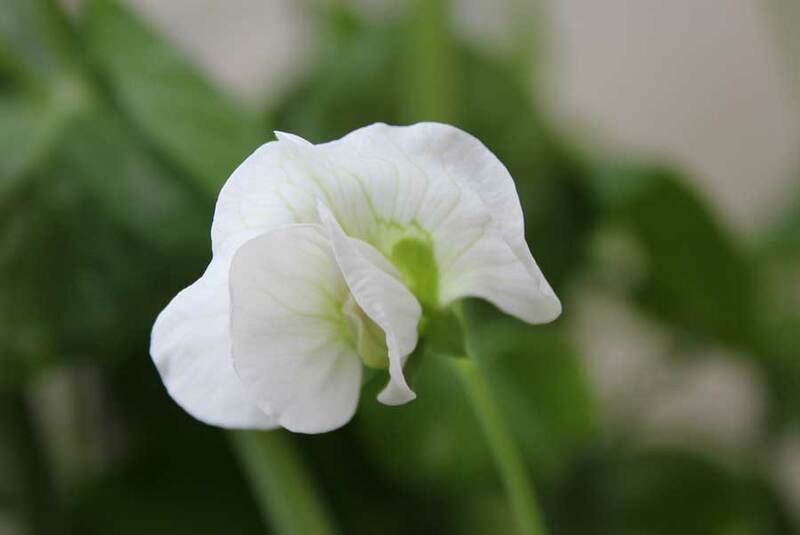 Climbing peas such as ‘Alderman Tall Climbing’ are picked when their plentiful pods are tightly swollen with tender peas inside. Pods are shelled and peas eaten separately. 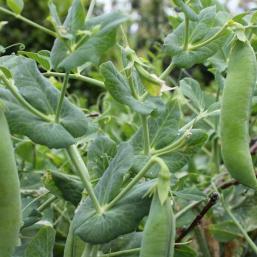 If you sow peas in phases – say a row or two every three weeks – you can enjoy a harvest from early summer right through to late autumn.